The 416 Fire burn scar poses a flood risk to homes below it. 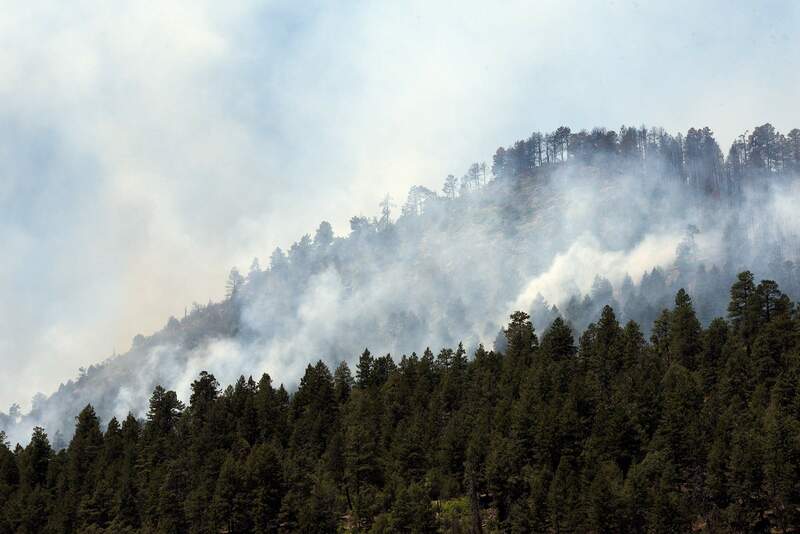 La Plata County issued pre-evacuation notices for areas south of the 416 Fire burn scar. 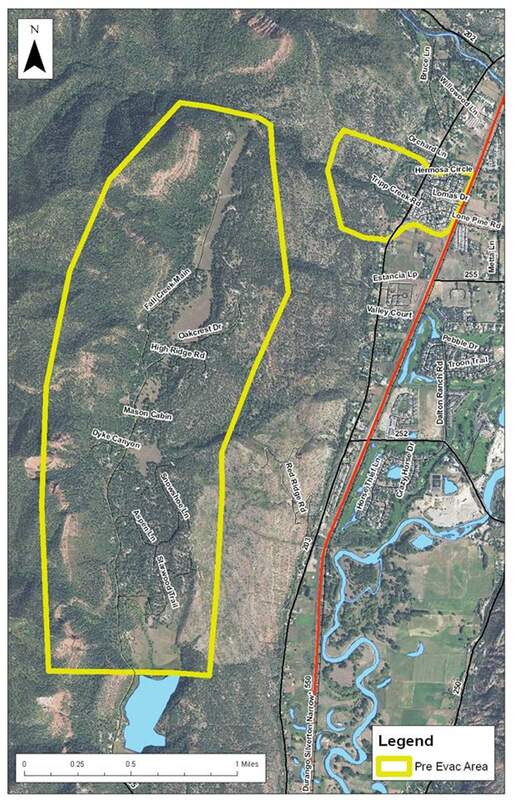 Intense thunderstorms could bring large debris flows down streams on the southern end of the 416 Fire burn scar into neighborhoods, La Plata County officials told a crowd Saturday evening at Miller Middle School. The flood risk is expected to be sustained through next week by rains that could bring 2 inches of precipitation to the area around the burn scar over a four-day period, said Gerry Claycomb, incident meteorologist for the National Incident Management Organization working on the 416 Fire. Moisture is expected to arrive from the Gulf of Mexico on Wednesday and it could bring daily storms through Saturday, he said. The forecasts are not 100 percent accurate and not all the rain is expected to fall on the burn scar. But it wouldn’t take much rain to cause flooding below the burn area, especially if heavy rain falls in a short time period, said Butch Knowlton, La Pata County Emergency Management Director. “Larger rainstorms will move debris, will move ash and it will move down those canyons,” he said. Some areas at highest risk received pre-evacuation notices Friday. La Plata County issued pre-evacuation notices to 317 homes in the Tripp Creek, Dyke Canyon, Hermosa Circle and Falls Creek Ranch areas. The notice also went out to residents in the High Meadows subdivisions and the Durango Regency mobile home park, on Sanctuary Lane and along County Roads 203 and 205. Those notices will stay in place while there is a risk of flooding, La Plata County spokeswoman Megan Graham said. La Plata County Sheriff Sean Smith called on attendees to heed evacuation notices ahead of pending floods if they are issued. Residents who choose to stay in their homes could put emergency responders at risk if they have to be rescued later. “Don’t put yourself at risk, don’t put them at risk,” he said. He also warned that there may not be a lot of time for residents to leave once debris starts to flow. Both Knowlton and Smith likened the pending risk to the flooding that followed the Missionary Ridge Fire in 2002 and brought walls of mud, logs and ash down the mountain. La Plata County has installed rain gauges in critical drainage areas to monitor the risk, Knowlton said. A portable radar unit has also been installed on top of Missionary Ridge to get a better idea of the density of moisture in storms, he said. Road and bridge equipment was also staged this weekend and it is ready to be used to clear slides, he said. The flood risk is high right now, in part because the needles, leaves and other debris on the forest floor, which usually act like a sponge to absorb all the water, have burned in many areas, Knowlton said. An early assessment of 34,400 acres burned in the fire estimated that 54 percent of that area may have developed water-repellent soil. Soils stop absorbing water when burned, as dead plant debris releases waxy substances that coat soil particles. The substance “shrink-wraps” the soil, filling in the pores that would normally absorb water during rain events. The early assessment was completed by hydrologists, soil scientists, engineers, weed specialists, archaeologists, biologists and geographic information system analysts. The report found that the areas below Tripp Gulch and Dyke Canyon are the most likely to see intense flooding because they are narrow and there isn’t much room for flood waters to spread out, which could increase the velocity of flood water and potential for erosion. About 85 percent of Dyke Canyon was severely burned and it will not take a lot of water above the canyon to create problems for homeowners, he said. Falls Creek Main runs below Dyke Canyon. The risk below Tripp Gulch could be slightly less severe because there is more unburned vegetation in that area. Homes at risk below Tripp Gulch include those on County Road 203 and the Durango Regency mobile home park, Knowlton said. The area near Hermosa Creek also faces a flood risk, but it is less severe because it is a long stream that flows through less steep terrain, Knowlton said. On Monday, he hopes to start working with the Natural Resources Conservation Service on a plan to protect private homes. That could be tough because in some areas it might be difficult to set up protections for one home without affecting the flood risk for another home nearby, he said. His advice to homeowners at risk is to stay aware of the amount of rain falling during storms. “Try to understand what might be happening on the mountain behind you,” he said.